What Is the Lupus Spoon Theory? Shortly after I was diagnosed with lupus, a friend emailed me a link to what she referred to as a must-read for anyone with lupus. The article, titled The Spoon Theory, has been passed around and referenced to in many lupus groups, support sites, Facebook pages, Twitter feeds, and personal blogs for over 10 years. 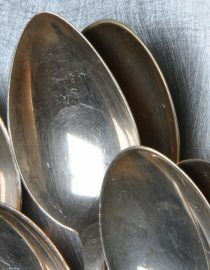 Some would call it a phenomenon with a large following of people that refer to themselves as “spoonies.” So what exactly is the spoon theory and how can the metaphor be helpful to those who have lupus? As the story goes, Christine Miserandino, who wrote the article, is having dinner with a friend who asks her what it feels like to have lupus. The question takes Christine by surprise because surely her friend must know — after all, she has accompanied Christine to the doctor, has witnessed her crying in pain, and has certainly seen her puke in the bathroom more than once. The friend clarifies; she wants to know what it feels like — not physically, but personally — to Christine. What does it feel like to be sick? Her friend is obviously confused, but is certainly willing to play along. Christine explains that most healthy people expect to have a never-ending supply of “spoons” each day, but when you are sick, your supply is limited. Each daily task “costs” a spoon — and when they are gone, they are gone. She goes on to explain that she needs to know how many spoons she has to start with so she can plan her day accordingly. At this point, Christine asks her friend to count the spoons in the bouquet — there are 12. Next, she has her friend share what she does every day. For each task rattled off — getting out of bed, showering, getting dressed, eating breakfast — Christine takes away a spoon. She says each little detail has to be considered, and decisions are made based on her circumstances for that day; for example, if her hands are hurting, she needs to choose something without buttons to wear. You might also like...Why Is Lupus Pregnancy Different from Typical Pregnancy? The friend realizes half of her spoons are gone and theoretically, she hasn’t even arrived at work yet. Christine reminds her friend how important it is to plan the rest of her day wisely. In order to accomplish certain tasks, others will have to go undone. There simply are not enough “spoons” to do everything. In the end, Christine hands her friend one more spoon. She explains she has learned to keep an extra spoon in her pocket — just in case. I like to think of the spoons in this analogy as representing energy. Although Christine’s friend was given 12 spoons, there really isn’t a magic number. Every day you may find you have more or less spoons depending on how you are doing on that particular day. If you are in the midst of a really bad flare, you may only have five spoons at your disposal for the entire day. However, on a really great day, you may find you have 20 available to you.